North America Travel Insurance Market is estimated to reach $8,165 million by 2022, growing at a CAGR of 8.8% from 2016 to 2022. Travel insurance covers the expenses incurred and minimizes the risks during travel. It acts as a cushion in an intense situation, thus governments of various countries and insurance regulatory bodies focus to create awareness related to travel insurance in terms of medical treatment, loss, trip issues, or evacuation from the country during the emergency. The North America travel insurance market is segmented based on distribution channel, insurance cover, end user, and countries. The distribution channel is segmented on the basis of insurance intermediaries, insurance company, bank, insurance broker, insurance aggregator, and others. For insurance cover, it is categorized into a single trip, annual multi-trip, and long stay. 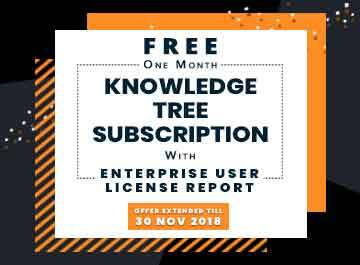 Based on the end user, it is classified into senior citizens, educational traveler, backpackers, business traveler, family traveler, and fully independent traveler. The countries covered are U.S., Canada, and Mexico. Single trip travel insurance accounts for a relatively large market share in the North American region due to the growth in business travel and rise in disposable income, which creates the need for safe traveling. However, more affordable and cheaper travel has made it easy for a number of family travelers, and fully independent travelers to take up several trips in a year, thus creating a substantial growing path for annual multi-trip travel insurance. Long stay travel insurance segment occupies the second largest market share, owing to the higher number of backpackers and educational travelers. Backpackers prefer long stay cover as they generally extend their stay in their country of travel, wherein they are allowed to work. While educational travelers need to secure their stay during the period of course completion, which is generally for a long duration, which creates the need for long-stay travel insurance. The U.S. accounts for more than 42% market share of the North America travel insurance market, wherein tour agencies and travel suppliers, such as tour operators and cruise lines are responsible for the major sale of travel insurance policies. According to industry estimates, more than 45% of the American population is currently more concerned while traveling than they were in the past, owing to the spread of epidemic disease, rise in terrorist attacks, and severe weather conditions. Travel insurance policies are widely opted by frequent travelers, well-educated groups, and individuals with high disposable income. Moreover, the number of overseas travelers, who opt for travel insurance are large in number as compared to domestic travelers. According to industry estimates in 2014, Americans spent over $2.2 billion on all types of travel protection in the same year, which represented an increase of 17.5% from 2012. 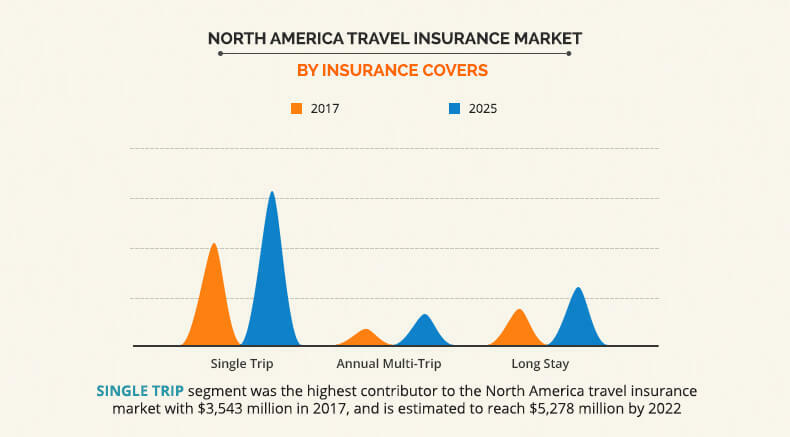 This growth is largely subject to a rise of multigenerational family travel, which supplements the growth of the North American travel insurance market. Moreover, these travelers opt to travel for long weekend trips and try to secure their travel from various concerns related to theft and health hazards. The global tourism industry has witnessed a steady growth in the past decade. According to WTO, international tourist arrivals grew at a rate of 4.4% in 2015 to reach $1,184 million, with North America witnessing a high outbound travel rate. Factors such as an increase in disposable income, package holidays, extensive coverage of holiday types by media, and easy online travel bookings have attributed to the growth in the tourism industry. As the tourist traffic is on an increase, more number of incidences of loss of luggage, important documents, medical emergencies, and natural calamities are being registered. To mitigate the risk associated with such incidences, there is an increase in a number of people opting for travel insurance. Therefore, the growth of tourism industry acts as a prime booster for the travel insurance market. The key players operating in the market include Seven Corners Inc. (U.S.), Travel Safe Insurance (Chester Perfetto Agency, Inc.) (U.S.), USI Insurance Services, LLC. (U.S.), MH Ross Travel Insurance Services, Inc. (U.S.), American International Group Inc. (U.S.), Travel Insured International (U.S.), Berkshire Hathaway Travel Protection (U.S.), Travelex Insurance Services Inc. (U.S.), American Express Company (U.S.) and CSA Travel Protection (U.S.). A comprehensive analysis of the current trends and future estimations in the market are provided. The report elucidates on key drivers, restraints, and opportunities and a detailed impact analysis from 2016 to 2022. Quantitative analysis is provided from 2014 - 2022, with 2015 as the base year and forecast from 2016 - 2022. Porters Five Forces model of the North America travel insurance industry illustrates the potency of the buyers and suppliers in the market. A quantitative analysis of the current scenario and the forecast period highlights the financial competency of the market. 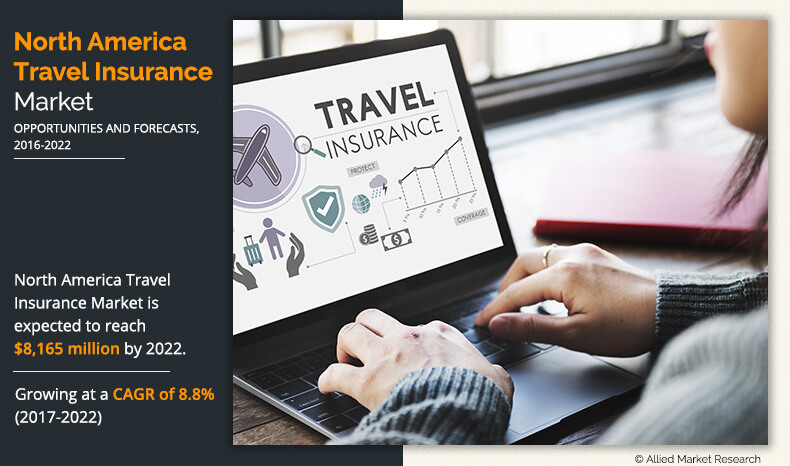 The report provides a detailed analysis of the North America travel insurance market with respect to the distribution channel, insurance cover, end user, and country. 7.4. MH ROSS TRAVEL INSURANCE SERVICES, INC.
7.5. AMERICAN INTERNATIONAL GROUP INC.
Travel insurance aims at safeguarding tourists during their travel. Rise in unusual events, such as natural disasters, outbreaks of viruses, and terrorist attacks have made travelers more aware about travel insurance claims to mitigate risks encountered during travel. Travel insurance covers medical treatment, trip cancellation, loss of baggage, evacuation or repatriation during an emergency, and loss of travel documents. Insurance services are provided by different operators which include insurance intermediaries, insurance companies, banks, insurance broker and aggregators. 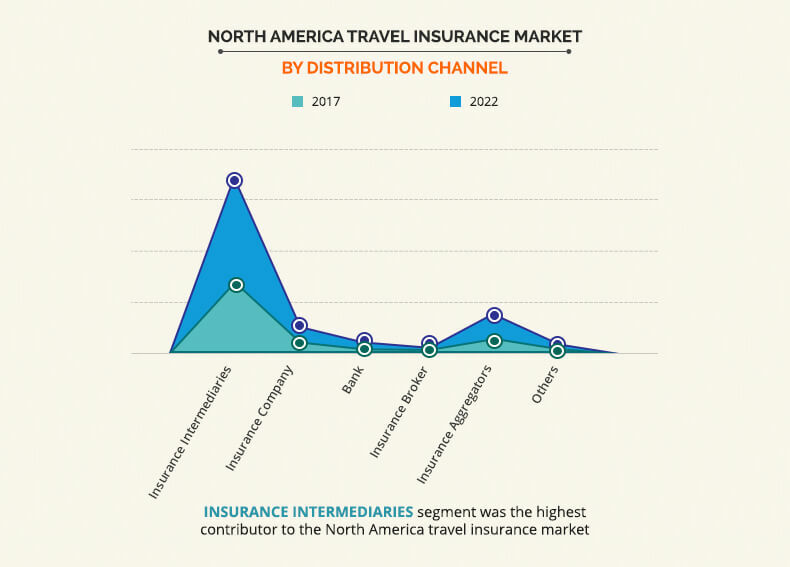 Amongst these, insurance intermediaries lead the North America travel insurance market, as they are one of the oldest and trusted form of distribution channels. These operators are preferred by senior citizens and baby boomers, due to the convenience and comfort level that agents provide in terms of delivering the services. In addition, insurance aggregators are expected to grow at a faster rate, with popularity among the younger generation as they are more inclined towards digitalized channels and equipped with sources to access them at any given point. Companies operating in the market offer different types of insurance covers depending upon the stay duration and number of trips. These can be broadly categorized as single trip travel insurance, annual multi-trip travel insurance and long-stay travel insurance. Among these, single trip is the most popular in North America, accounting for over 60% of the North America travel insurance market revenue. Overall, the North America travel insurance market will be driven by rise in tourism, particularly in outbound travelling. Furthermore, increase in awareness about these policies among the populace, rise in baby boomers travel and increasing use of digital channels for a greater customer reach are expected to drive the demand for travel insurance in the region. 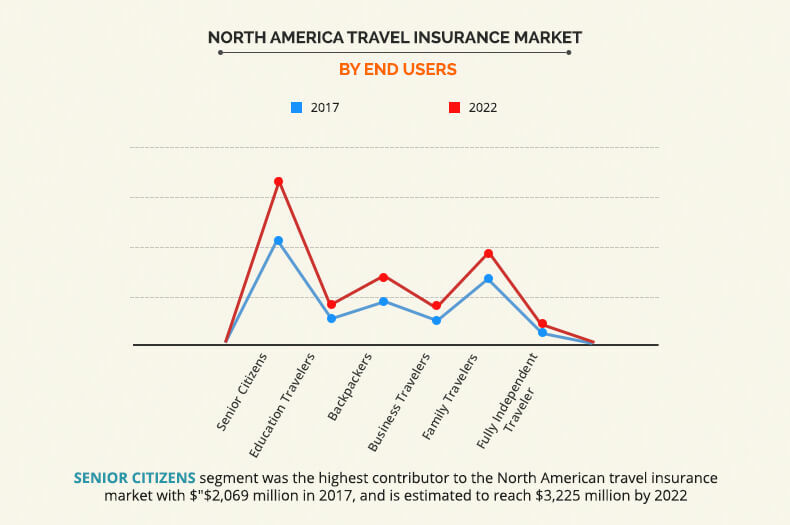 Established market players have maintained their dominance in the North America travel insurance industry even after the emergence of many new companies. However, with an aim to capture higher market share, the market players have launched various schemes such heavy discount options, value-added schemes and sports or activity-related policy for consumers. 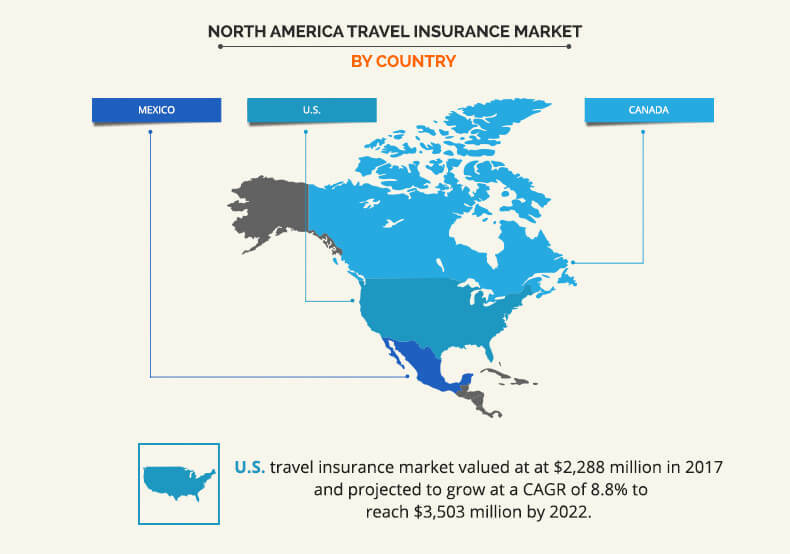 "North America Travel Insurance Market"